Where do all the cool people in town hang out? Want to meet other locavores? Want to learn about how to live a more local and green lifestyle (but don’t know where to start)? Then you need to sign up to get our sweet newsletter. 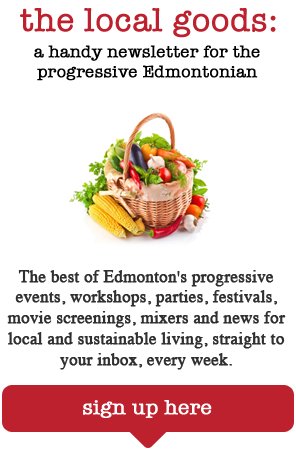 Just enter your email in the box to the right and once a month you’ll get Edmonton’s best curated collection of good, local events delivered to your inbox. We’re talking: festivals, movie screenings, parties, workshops & seminars, mixers, tours and more. Want to submit an event for our newsletter? Click here.